India’s Polar Satellite Launch vehicle blasted off in its year-ending mission on Wednesday, successfully delivering a group of six satellites to a Near-Equatorial Orbit for Singapore. Built by universities and industry, the satellites will fulfill a number of purposes from Earth observation and meteorology to technical demonstrations. 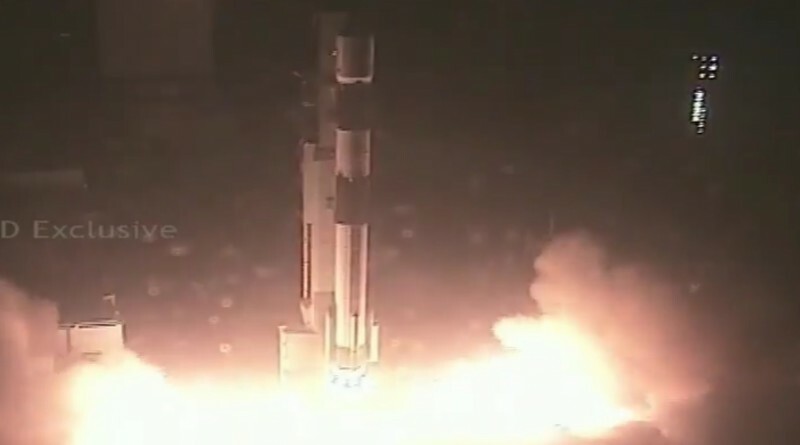 Liftoff took place at 12:30 UTC and the four-stage PSLV successfully fired its solid and liquid-fueled stages in an ascent mission lasting over 17 minutes to reach a 550-Kilometer orbit. All six satellites were separated as planned. Riding in the front seat as the primary payload of this flight was TeLEOS-1, a 400-Kilogram satellite outfitted with an Earth Observation Payload. 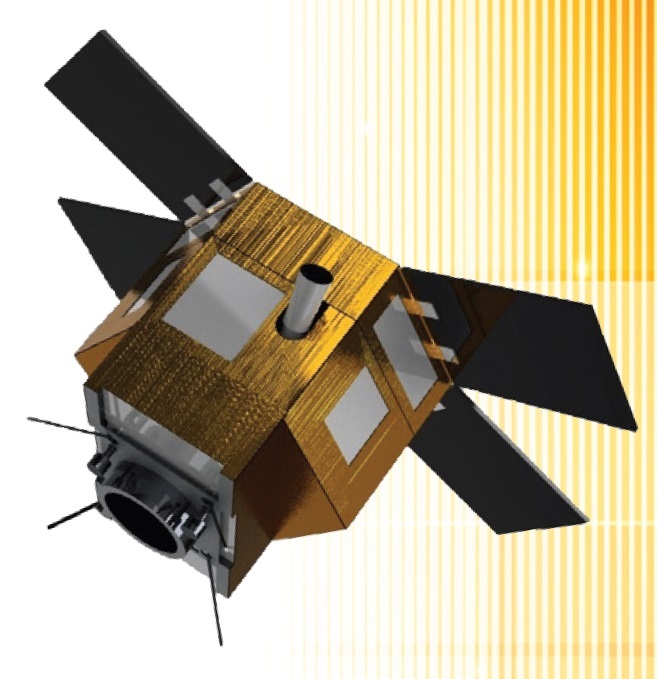 Built by ST Electronics and operated by AgilSpace, the satellite will collect imagery of the near-equatorial regions of the Earth to offer data products on the commercial market. Unique for this satellite is its orbit, only permitting the satellite to cover areas between 15° south and 15° north – instead of the global coverage offered by Sun Synchronous Satellites. However, this orbit brings the distinct advantage of an extremely high-revisit time with up to six daylight passes over targets every day. TeLEOS-1 can deliver imagery at a resolution of one meter with an average revisit time of 12 to 16 hours. The mission supports quick-tasking and fast data distribution with support of Satrec and Spot Asia that signed agreements to distribute TeLEOS imagery. VELOX-CI, one of several satellites on this flight built by Nanyang Technological University, weighs in at 123 Kilograms and is outfitted with an experimental attitude control system using GPS signals in combination with an Inertial Measurement System. The primary payload of the satellite is a GPS receiver for occultation measurements to generate vertical profiles of atmospheric parameters including temperature, pressure and humidity. Kent Ridge 1 is an 80-Kilogram satellite operated by the National University of Singapore, with support from Berlin Space Technology. It is outfitted with three payloads, a pair of Fourier Transform Recovery spectrometers covering the visible, near infrared and short-wave infrared bands making use of a novel spectroscopy method that no longer relies on diffractive elements and utilizes polarization filters in combination with new extraction algorithms. A secondary payload, a high-resolution camera, delivers video of Earth in color, reaching a resolution of 6 meters. These three satellites are joined by a group of three differently sized CubeSats – VELOX II, a six-Unit CubeSat with a mass of 13 Kilograms setting out to demonstrate a communications package enabling data relay to Geostationary Satellites, Galassia is a 2U CubeSat from the University of Singapore outfitted with a Total Electron Counter and a Small Photon-Entangling System instrument for the correlation of quantum data to gather information for the concept verification of quantum-based communications, and Athenoxat-1, a 3U CubeSat built by MicroSpace, carrying an imaging system optimized for nighttime operation. 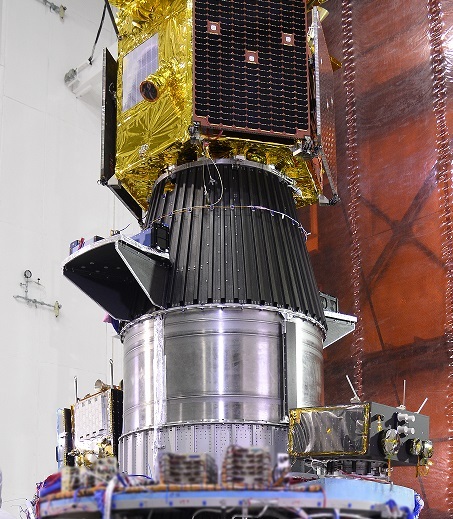 To lift the six satellites into orbit, PSLV flew in a stripped-down version, known as the Core Alone Configuration that only uses the four-stage PSLV stack, not featuring boosters clustered around the first stage. The rocket stands 44.5 meters tall, has a core diameter of 2.8 meters and weighs 229,000 Kilograms at liftoff using a combination of liquid- and solid-fueled rocket stages. 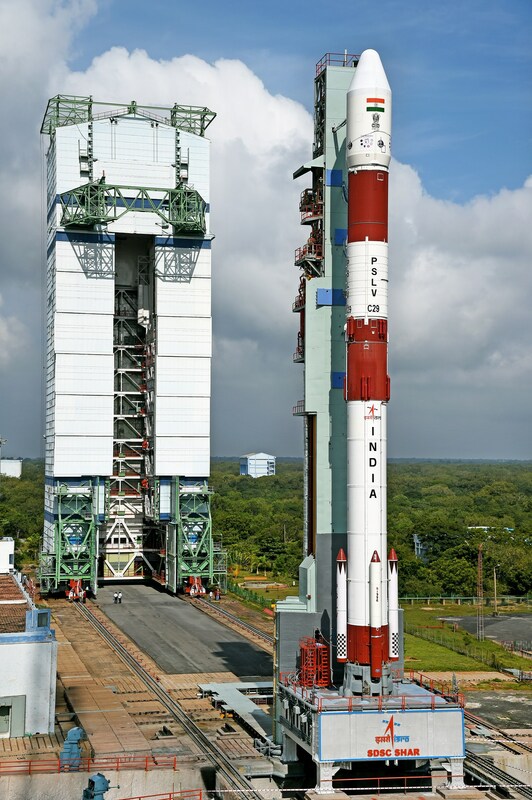 The PSLV launcher consists of a large core stage that is 20.34 meters long and holds 138,000 Kilograms of solid propellant – making it one of the largest solid rocket stages ever flown. It provides a whopping thrust of 495,600 Kilograms-force. 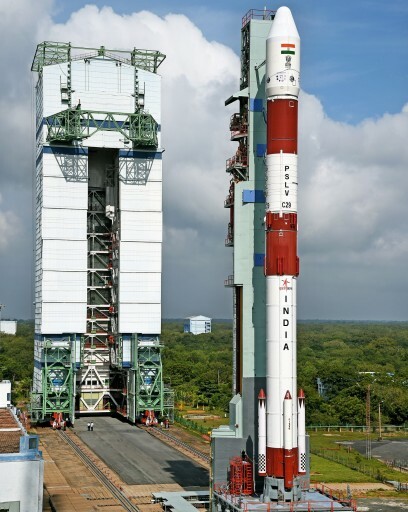 The second stage of the launch vehicle uses storable propellants, consumed by a single Vikas 4 engine that provides 81,500kgf of vacuum thrust. The stage is 12.8 meters long with a 40,700-Kilogram propellant load. The PS3 stage of the PSLV launcher is solid-fueled, being 2.02 meters in diameter and 3.54 meters long holding 6,700 Kilograms of HTPB-based propellant. The third stage provides a total thrust of 24,900 Kilogram-force. Stacked atop the third stage is the PS4 Upper Stage that again uses hypergolic propellants – Monomethylhydrazine fuel and Mixed Oxides of Nitrogen – consumed by two L-2-5 engines, generating 1,500kgf of thrust. The stage is 2.02 meters in diameter and 2.6 meters long with a partial fuel load of 1,600 Kilograms. 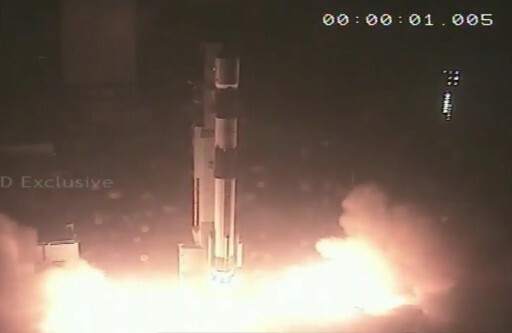 PSLV lifted off from the Satish Dhawan Space Center on India’s east coast at 12:30 UTC on Wednesday, climbing vertically before pitching and rolling on a south-easterly departure path, assisted by a Secondary Injection Thrust Vector Control system and a pair of hypergolic-fueled roll control thrusters. With its extremely powerful first stage and an initial thrust to weight ratio in excess of two, PSLV quickly passed the speed of sound, lighting up the evening skies over India. Thrust on the first stage started tailing off one minute and 45 seconds into the flight followed by the separation of the stage at T+1:51.8 and the ignition of the Vikas engine of the second stage another 1.8 seconds later. Now powered by the second stage, the rocket initiated Closed-Loop Guidance to process navigation data to optimize its flight path towards its precise cutoff target. PSLV shed its payload fairing two minutes and 52 seconds after launch to expose its satellite payload. The second stage finished its job and separated from the third stage four minutes and 27.8 seconds into the flight. One second later, the third stage ignited its solid rocket motor for a burn of 112 seconds after which the rocket held onto the stage for another three and a half minutes to allow residual thrust to tail off. The third stage delivered the stack to a sub-orbital trajectory with a short fourth stage burn needed to circularize the orbit at 550 Kilometers. This 2-minute and 19-second burn started 15 minutes and 3 seconds after launch and successfully placed the stack into its target orbit. The elaborate spacecraft separation sequence picked up at T+19 minutes and 9 seconds when the TeLEOS-1 main payload was sent on its way followed thirty seconds later by Kent Ridge 1 and VELOX-CI that were separated simultaneously. The three CubeSat payloads were released at T+20 minutes and 9 seconds starting with VELOX-II followed by Galassia 55 seconds later and Athenoxat-1 after another 55-second interval. The separation of all satellites was confirmed, marking another success for the PSLV on a mission with a total payload mass of 624 Kilograms. In a secondary mission, the fourth stage of the rocket was to go through an extended coast phase and a short re-start of its engine one hour and 7 minutes into the flight. This test was for an evaluation of the fourth-stage’s capabilities for multi-orbit missions, that is launching several satellites into different orbits with main engine firings in between separation events. The four second burn, a 2.6m/s engine burn, was designed to deliver data to assess the performance of the engine and the critical re-start dynamics that need to be fully understood to confirm the engine can reliably perform multiple burns. 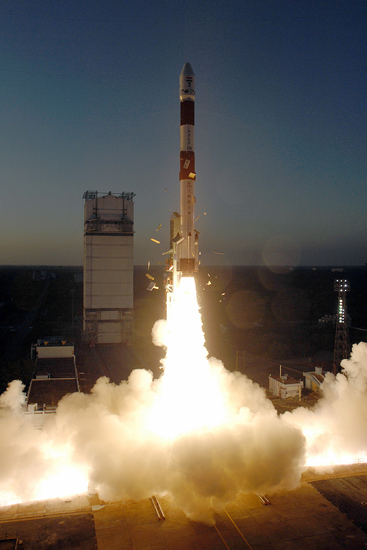 The test burn was confirmed to be a success by ISRO officials and PSLV is expected to use this capability in an operational mission as early as next year.